You can use this versatile mat at home, in gyms or health clubs. It is made from four interlocking pieces to create a comfortable and shock absorbing surface, ideal for energetic and demanding exercise. The 66fit Interlocking Floor Mats are ideal for placement under exercise equipment such as treadmills, exercise bikes, benches etc. 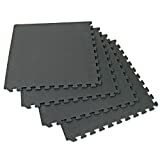 Made from quality grade EVA, each of the 4 mats are 60cm x 60cm and are interlocking (like a jigsaw) They are 1.3cm in depth. Not only are they ideal for placement underneath exercise equipment, they are ideal for putting underneath washing machines, tumble dryers etc.